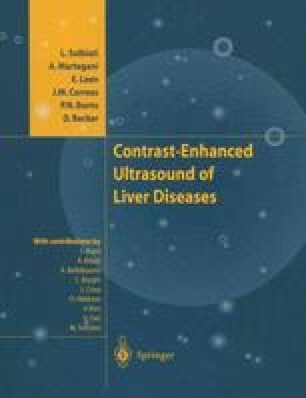 One of the major diagnostic objectives in using an ultrasound contrast agent in the liver is to detect flow in the circulation at a level that is lower than would otherwise be possible. The echoes from blood associated with such flow — in the sinusoids for example — exist in the midst of echoes from the surrounding solid structures of the liver parenchyma, echoes which are almost always stronger than even the contrast-enhanced blood echo. When they can be seen, blood vessels in a nonenhanced image have a low echo level, so that an echo-enhancing agent actually lowers the contrast between blood and the surrounding tissue, making the lumen of the blood vessel less visible.